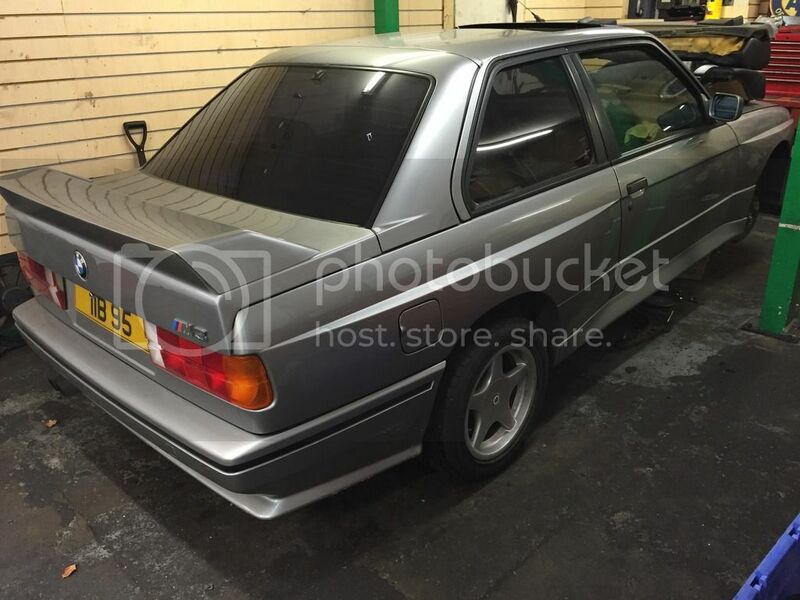 Another E30 M3 needing some love came along.... so i bought it! Unfortunately i don't have many pictures of it when first bought but here is one not long after bought and mid way through some work. A bit more about this particular M3. 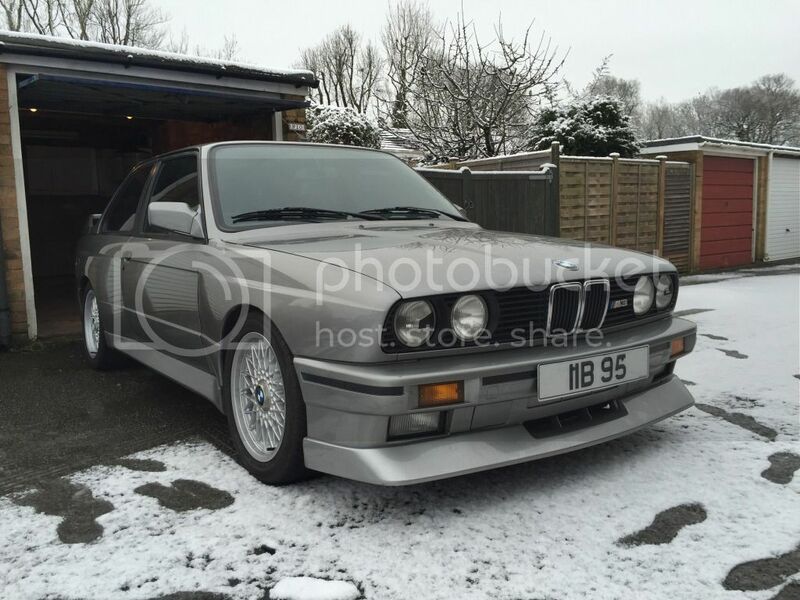 Like the white one, this is also one of the first 5000 built to homologate the M3 for group A motorsport with this one being an even earlier built car. Another AK01 (non cat 200bhp car) Built on 14/11/86 in Lachs silver 203 with anthracite "houndstooth" cloth 0211 with the following options. So a bit more optioned up than the white car! This car however was not an original UK supplied car but more on that later! The car came into work with a view to being sold by the usual sale or return arrangement at Munich Legends but after being inspected it would have needed at lot of work to get it up to our high standards some of which would have required a high initial investment before it could even be advertised and as the owner wanted a quick sale i made an offer and it got accepted. WOW! 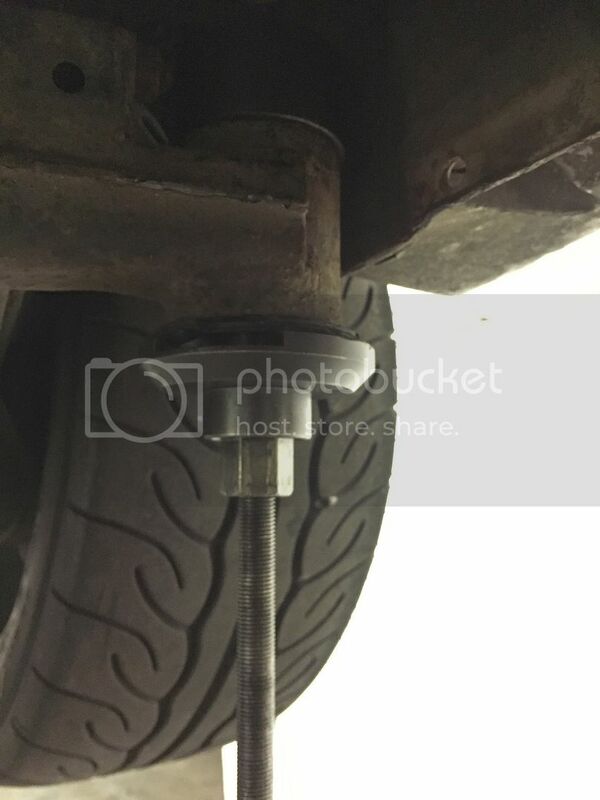 I'm sure some of you thought that after looking at the last couple of pics and this was one of the more expensive things that would have had to have been sorted before the car was even advertised. Someone (more on that later!) went to a lot of time money and effort to create this two tone effort and that had to go! 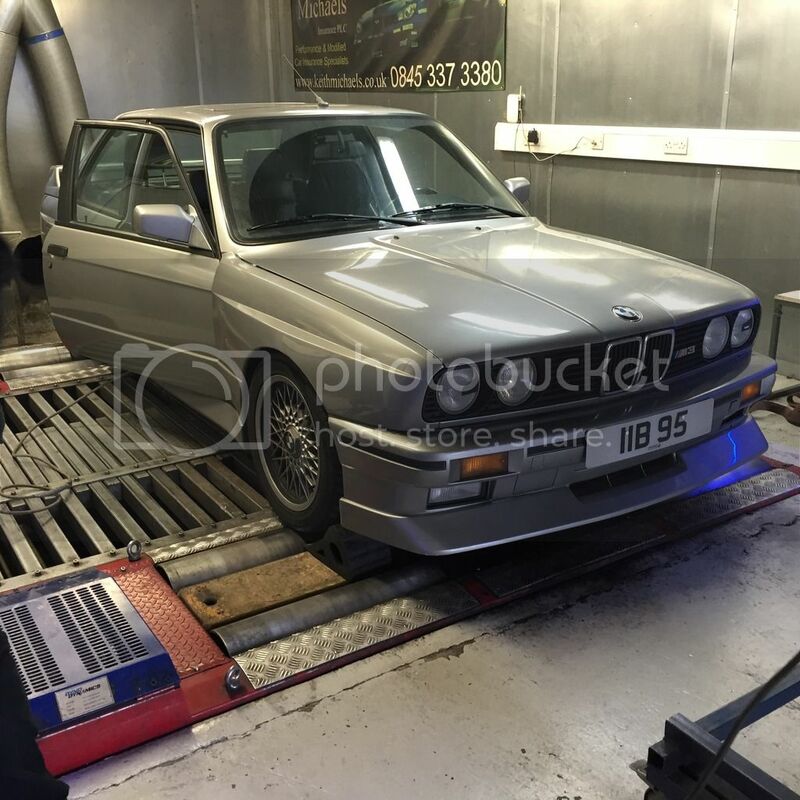 As you can see from the first pic, the car was rolling on a set of racing dynamics - in 15" - which seriously dated the car but in a bad way, another thing which would have needed to have been changed prior to advertising and also not cheap to sort out. These two things combined with the window tints made up to create a very late 80's/early 90's look now considered distasteful so this had to be sorted ASAP! Other than the style efforts, the car was very low and stiff which turned out to have BMW motorsport group N bilsteins and unknown progressive rate springs which i estimated to be approx 50-60mm lowered. 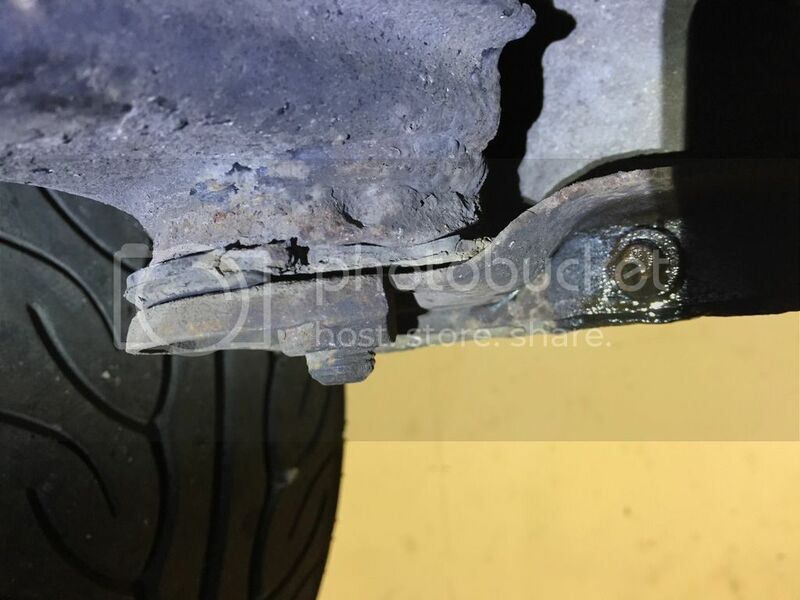 Body condition is very good with virtually no rust, the only bits found are some very early stages of where the wheel arch meets the sill and the square factory lifting pads being a bit frilly. The car has only covered 77k miles from new and a big part in why the mileage is pretty low is due to the fact that it has been dry stored and not been taxed since 1994!!! Unbelievable! 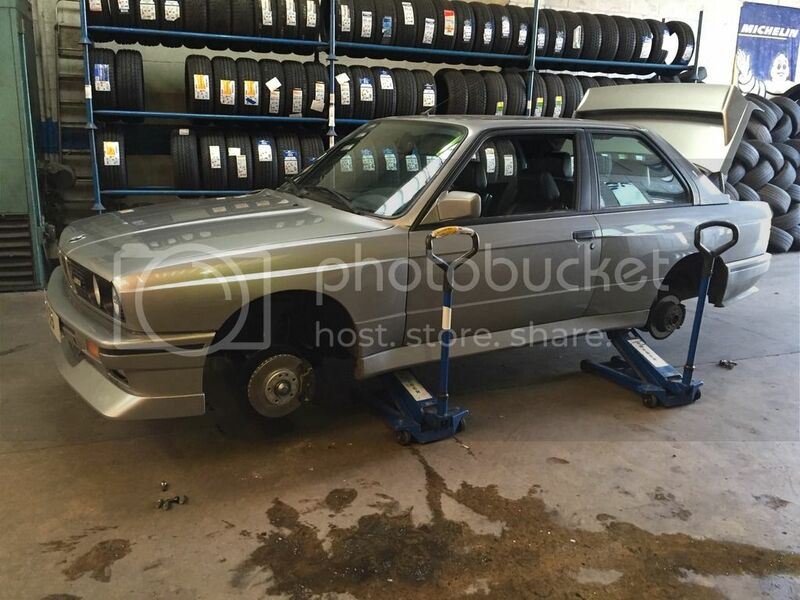 The story behind the car is that it was taken in payment for a building job and for some reason kept unsold, possibly because no one wanted to buy it looking the way it did?! 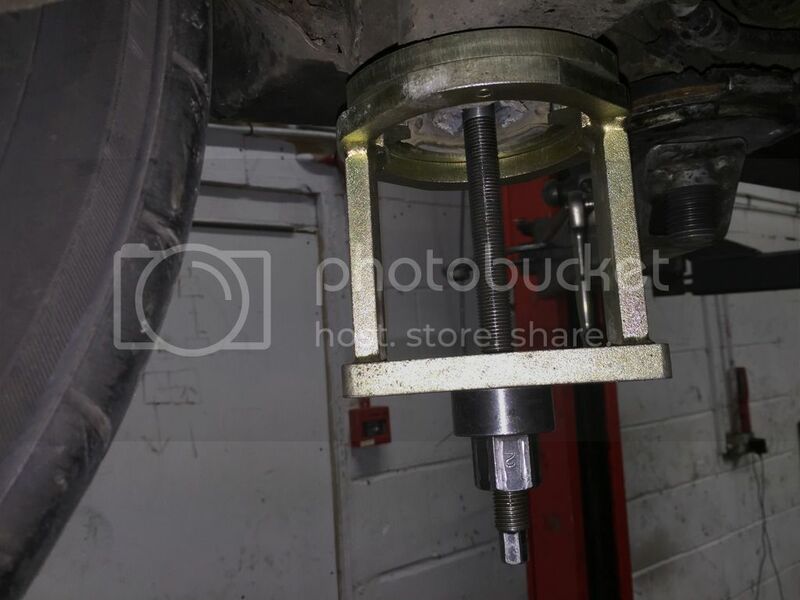 So work commenced pretty much straight away and first thing to be tackled was the suspension because it was so stiff and uncomfortable to drive on the road. 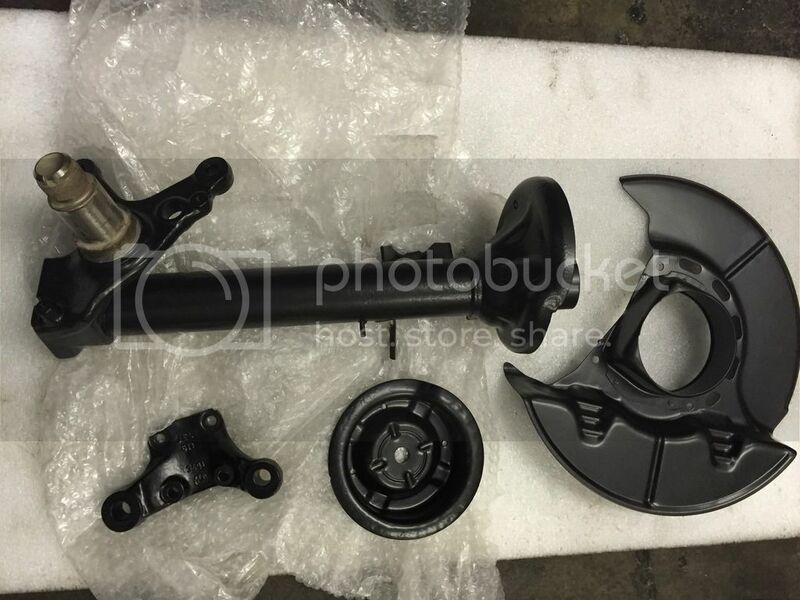 New front brake back plates were bought and those along with the front struts were blasted and power coated satin black. 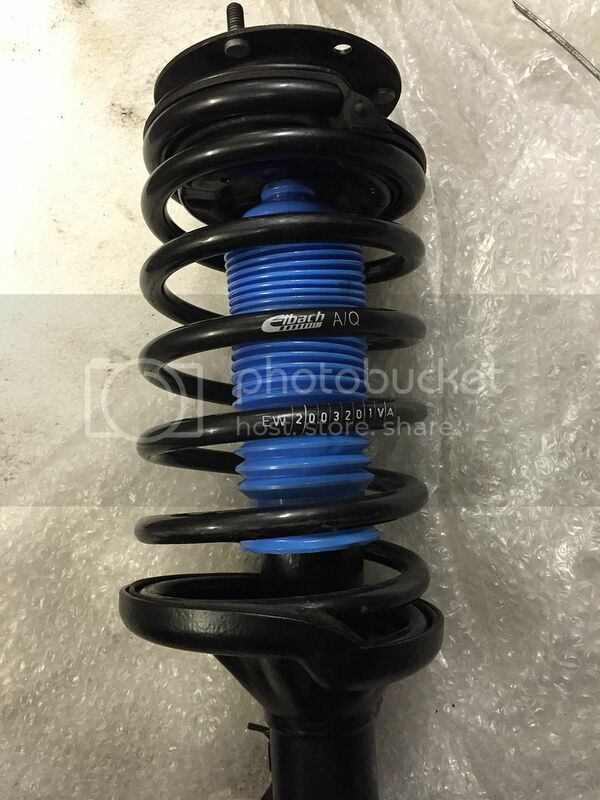 Four new Bilstein B8 shocks and eibach pro kit springs (same as what was on the white M3 and my 325i Sport) were ordered up as well as a pair of new wishbones, eccentric wishbone bushes, camber correction top mounts, E46 convertible rear top mounts, Z3 reinforcement plates, front drop links, and a set of new unused eibach adjustable roll bars sourced from Kos were fitted which has transformed the way the car rides and handles compared to what was on before. 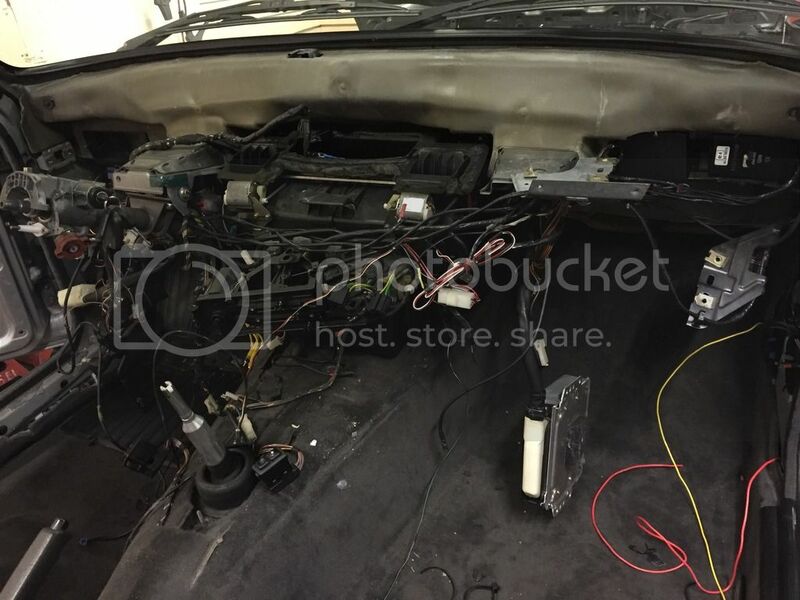 The red dashboard removed and the bulkhead inspected as much as could be with with no signs of rot or dampness. Some rectification work was required to the alarm wiring and a minty mint black dash from Paul Z3I was fitted. 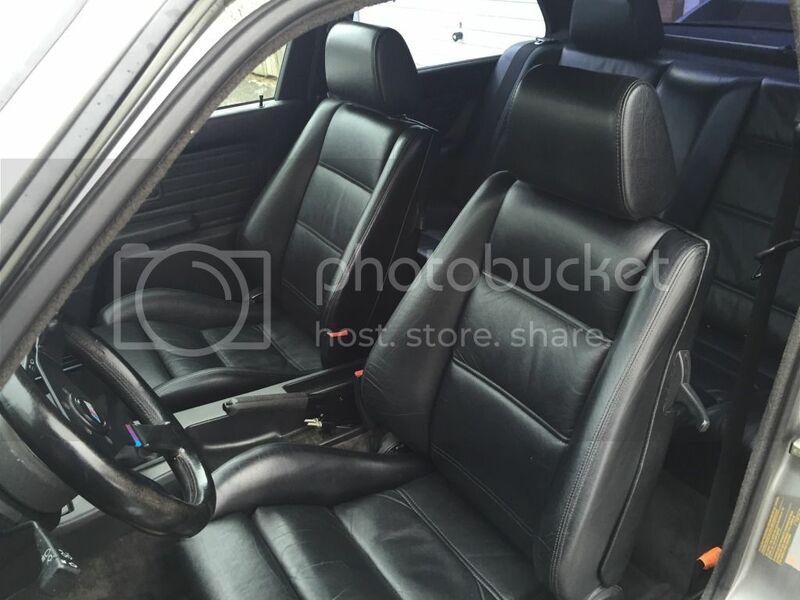 A set of very nice original heated black leather seats were bought from Paul bmwe30metch and various other interior parts such as door cards, Hifi pack rear blind shelf and consoles from pacerpete all made up to create a nice place to be. 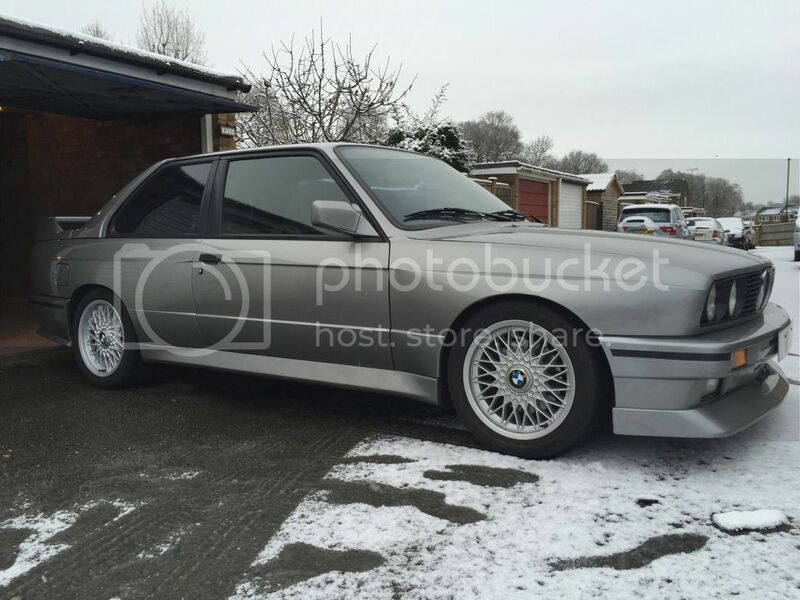 Last of all, the 15" racing dynamics needed to go and a few sets of wheels were considered but one set i did want were a set of M3 16" BBS and as luck would have it a fairly tidy set with tyres popped up on the E30zone FB page being sold by Joel so these were snapped up a completed to "back to OEM" look. As you can see, it has an Evo 2 front spoiler which it came with and the window tints have since been removed. Looks great! The old interior was... unique. I can't tell you how much I love this thread,,, and what you did with this car. You did a great thing recuing that poor car. Wish you many happy years with it in its restored refreshed state. Great work looks very good with all the work you have been doing the more stock look really suits & looks good. How did you figure out they were the group N inserts in the front and can this bee seen with out disassembly? I noticed the out side head lamps have stickers on the lens is this to improve the cut off patten on low beam. I just noticed the headlamps as well. The way they're positioned seems like it would shield oncoming drivers from glare, but only if you were driving on the right-hand side of the road, which makes some sense if this car was not a UK market car initially. I'm not sure why it couldn't be dialed out with correct aiming? I'm curious to hear the answer. You're right the stickers are used to adjust the beam if you are driving on the opposite side of the road to what you would normally so you don't blind oncoming traffic. I guess the previous owner put stickers on instead of fitting rhd headlights, although they don't look right I thought the angled bit should be going down not up. The projector headlights on later cars had adjustment for lhd or rhd the earlier ones don't. This will soon be rectified with correct RHD specific head lights. SO, being the inquisitive type i was looking though the history and found an old log book from 1991 with the first and second owners details. 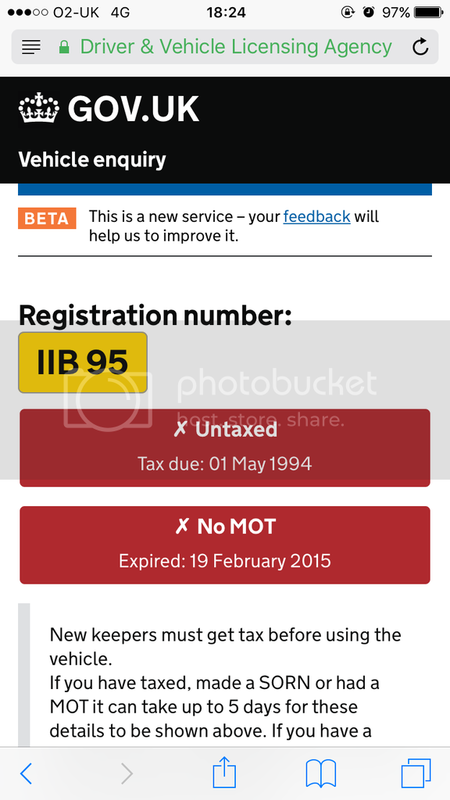 The 3 owner from who i got the car from for some reason never registered it in his name when he got it in approx 1995 and the story goes is that he took it in payment for a building job. I googled the two owners on the log book and the second owner came up as a company director for a couple of companies but nothing significant but when i searched the first owners name, it also came up as a company director and i instantly recognised the the company name... Zeemax. 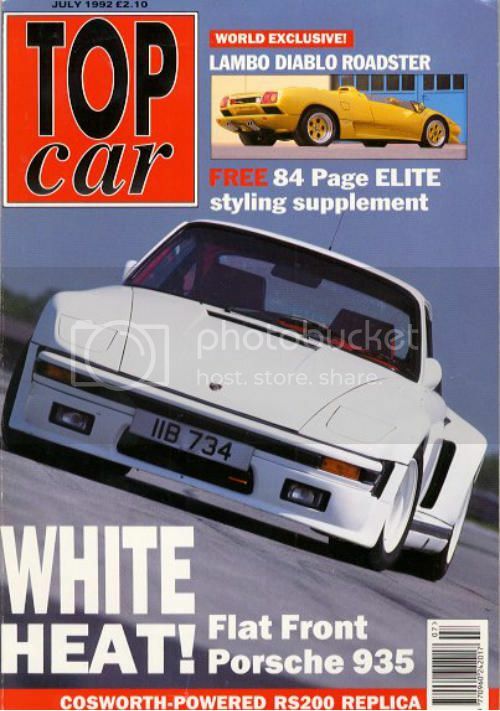 The guy who bought the car new was Barry Perman aka mr Zeemax and some of you older guys who were into modding in the 90's may remember Zeemax and after an exchange of emails via the website i got the story on the car up until he sold it in 1991. He had the car imported by a company in Hayes, West London called Cars international who sourced the car from a German dealer called Kohl who are a multi franchise dealer and is also AC Schnitzer. The car was a couple of years old but unsold and unregistered when it was imported and as with the white M3, it was one of the first 5000 built to homologate the M3 for group A motorsport. One can only assume that BMW just built the first 5000 cars within the required 12 months without all of them being ordered and sold so this may go some way to explain why this car was kicking about for a couple of years (and the white one 11 months) before being sold. I asked Barry Perman about the sale and he just said that it was cheaper and better specced than if he ordered new in the UK and it was then that the car received the reg IIB 95. This Porsche was one of Zeemax's creations in the early 90's and note the reg of the car. What relevance the IIB plates has to Zeemax i do not know. 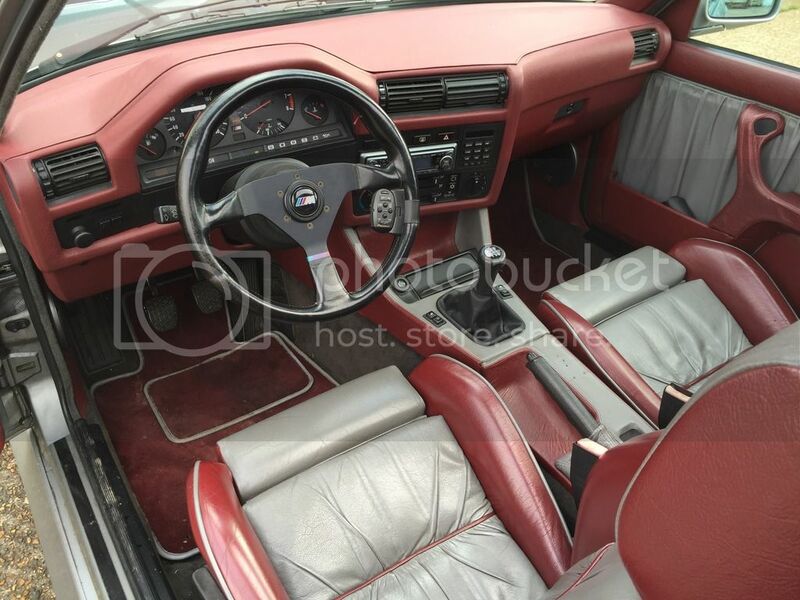 Not long after he bought the car he had the interior done in the burgundy and grey leather which fits if you look at some of Zeemax's work and by sheer coincidence he saw the interior for sale on ebay a few weeks back... what are the chances of that?! As well as the interior he also fitted the 15" Racing Dynamics wheels and he also had an exhaust made by a "racing company in Milton Keynes. I informed him that it has since been replaced with a standard BMW system to which he replied "I'm not surprised as it was very loud and used to spit flames". When i first drove this car i instantly thought "this is quick!" 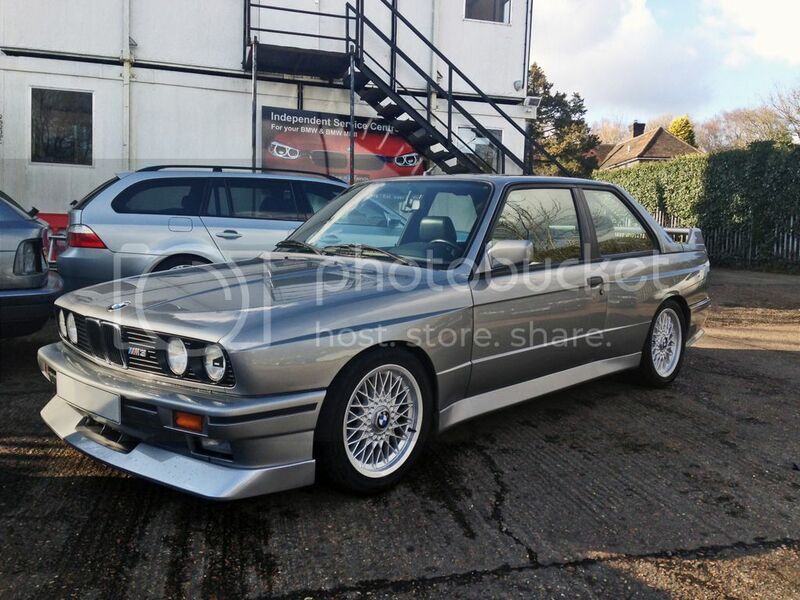 much quicker than any non Evo E30 M3 I've driven and I've driven many through the course of work. The other two people who drove the car at work were also in agreement without being prompted on how quick it was and that always had me intrigued. When i ended up speaking to Barry and he said it came from AC schnitzer when new i began to put two and two together so i asked he if anything had been done to the engine as the car felt quicker than any non evo i had driven. BBR aka Brodie Brittain Racing were well known for the exploits in tuning Sierras Cosworths in the 80's and 90's and also went on to develop the Mazda MX5 turbos which were sold in kit form through Mazda dealers in the UK but they also had their hand in other sorts of performance cars back in the day. I contacted them to see if they had any info on the car and sadly the founding partners sold the company in 1999 and the current owners do not have records going back as far as 1989-1991. I have since contacted both Ken and David but have not heard back from either. So where does that leave me. 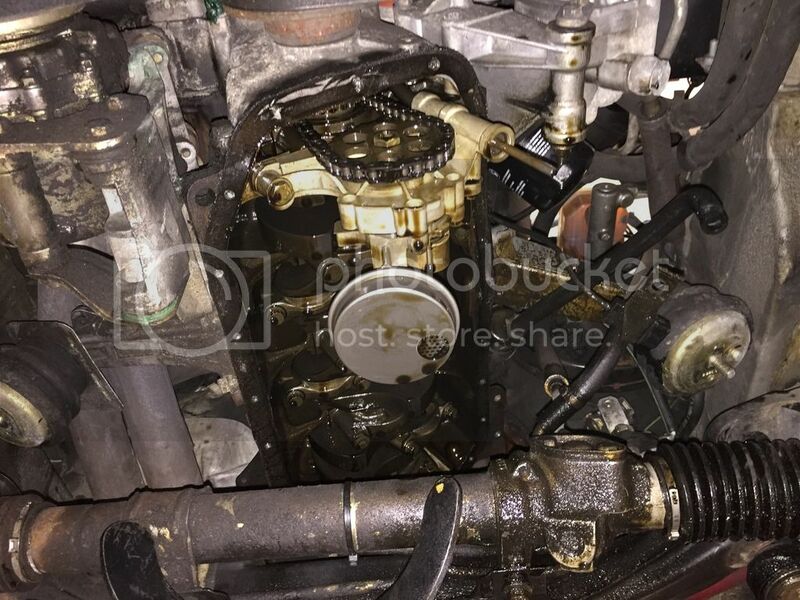 I know its not a 2.5 from a simple check but I need to find out whats going on inside the engine so when i get the chance i will be doing a compression test, cylinder leakage test and an oil pressure test to check the health of it. 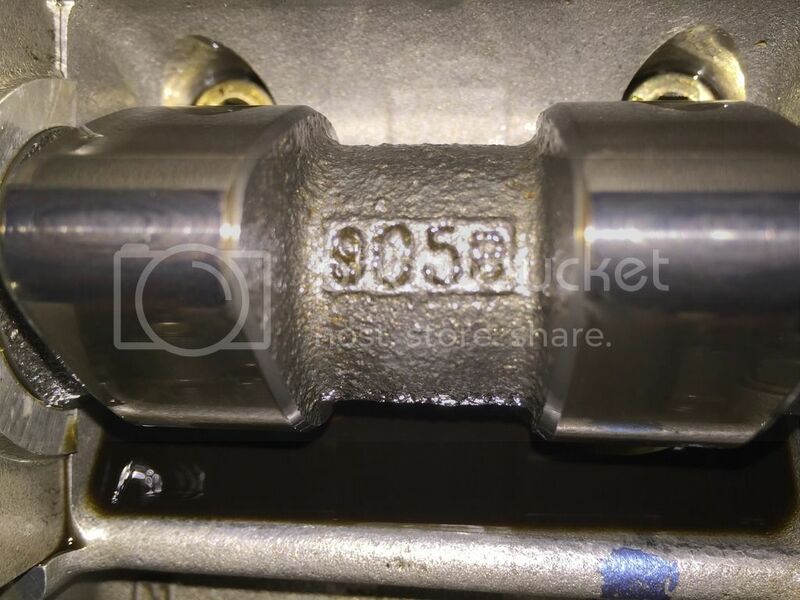 I will then be checking and adjusting the valve clearances so when doing this i will inspect the cams for any identification as to what they may be. 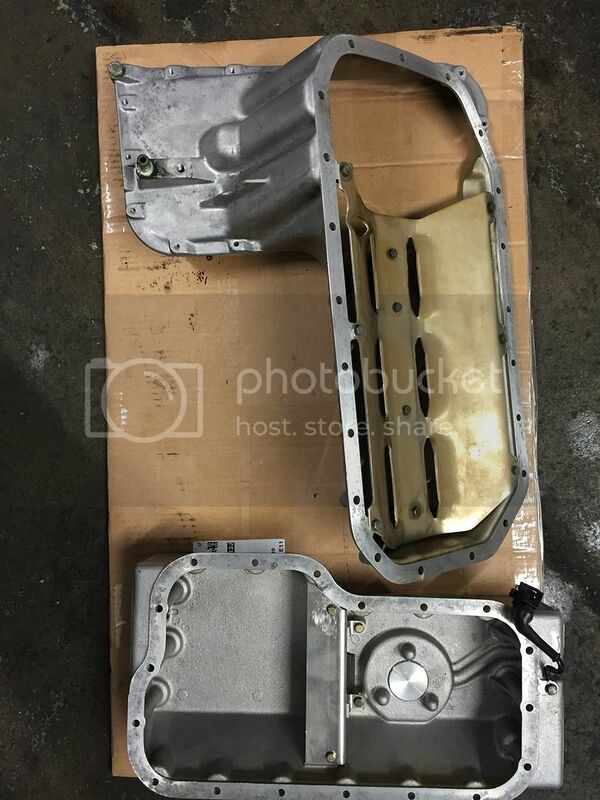 I will also check the part number of the head to see if its an evo or 215 head and i will inspect the top of the pistons with a bore scope to see if these are different from standard. Before all that I'm going to check the part number of the DME and also pop it open to see if its been chipped. 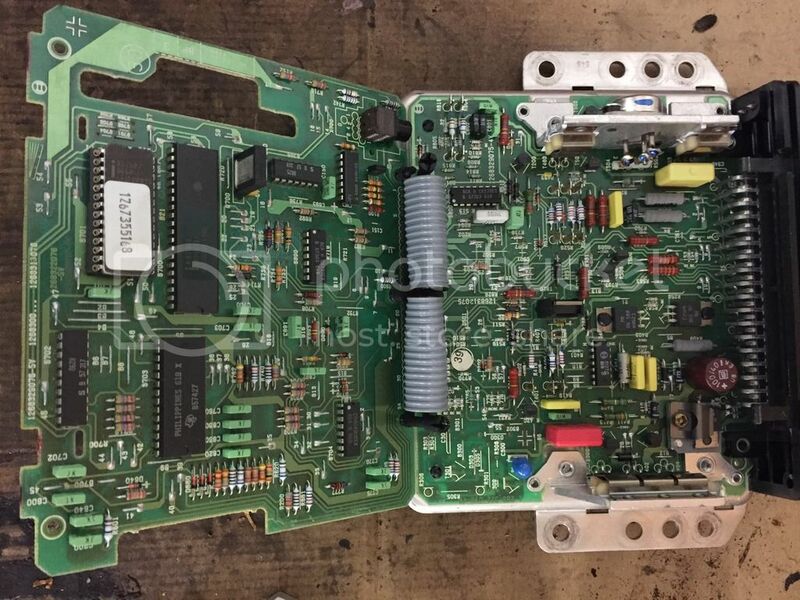 My 325i Sport has a copy of a BBR chip incidentally and i know who has the original. Once all thats done it will be off to the dyno and if it churns out 220bhp i will be very happy, any more and ill be over the moon! So thats it, an interesting start to its life which hopefully will transpire to have something a bit tasty inside the engine. Great detective work! Terrific backstory, I look forward to seeing what you uncover about the motor build. Hopefully the BBR guys get back to you. 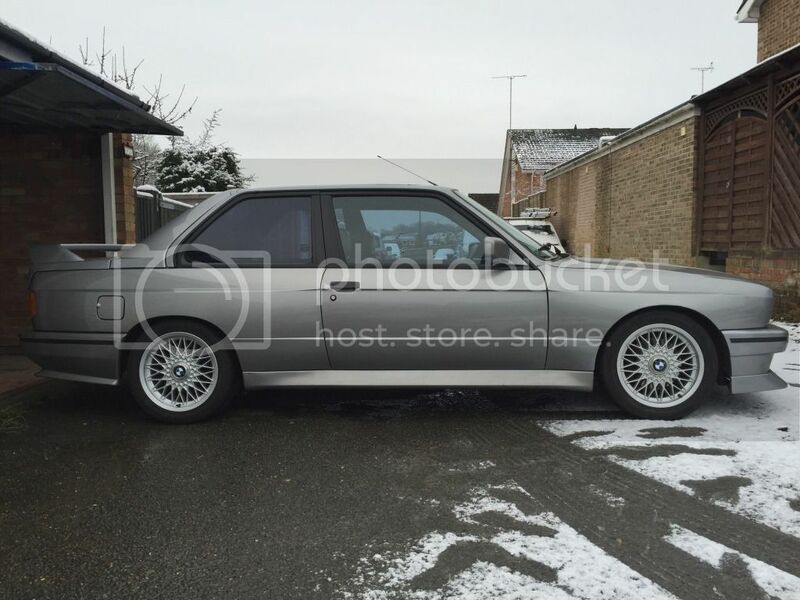 you didn't buy a e30 M3... You Saved it!! A recent pic of it parked up at work. 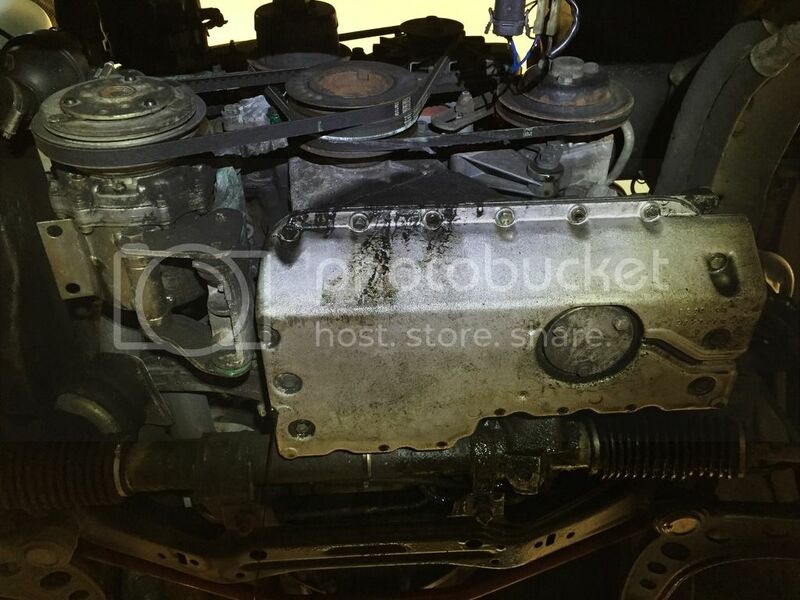 With the knowledge that the engine had been rebuilt and upgraded by BBR it was time to do some investigation as to what had exactly been done. 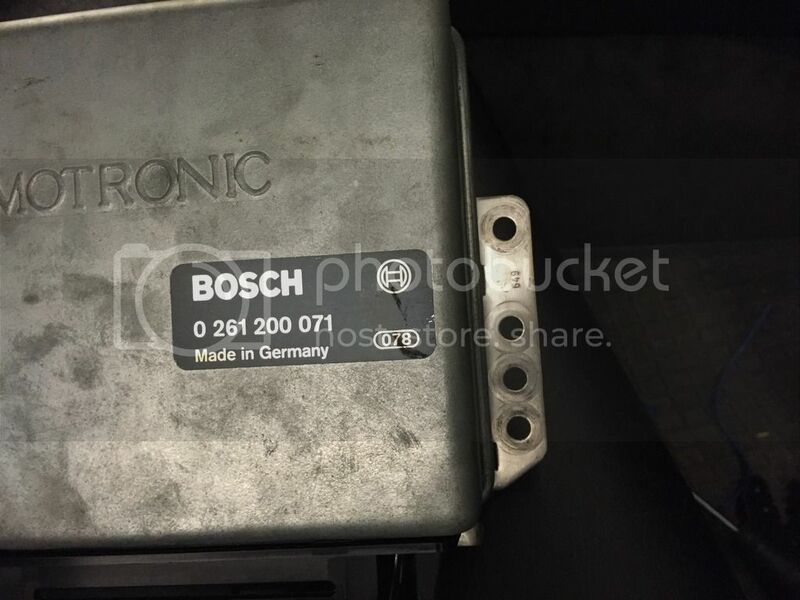 Firstly i removed the DME to find the correct bosch number but in black not the usual green or red and no VIN number label. Possibly a replacement? 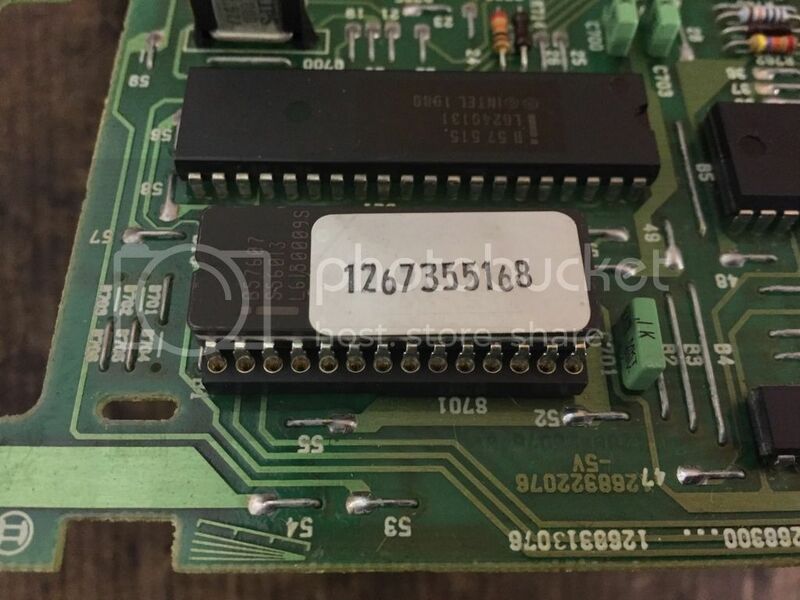 Opening the DME up revealed that the eprom chip has been changed but I'm unable to identify it. I suspect its one of BBR's own chips as they built the engine and i know they offered chips for various cars. 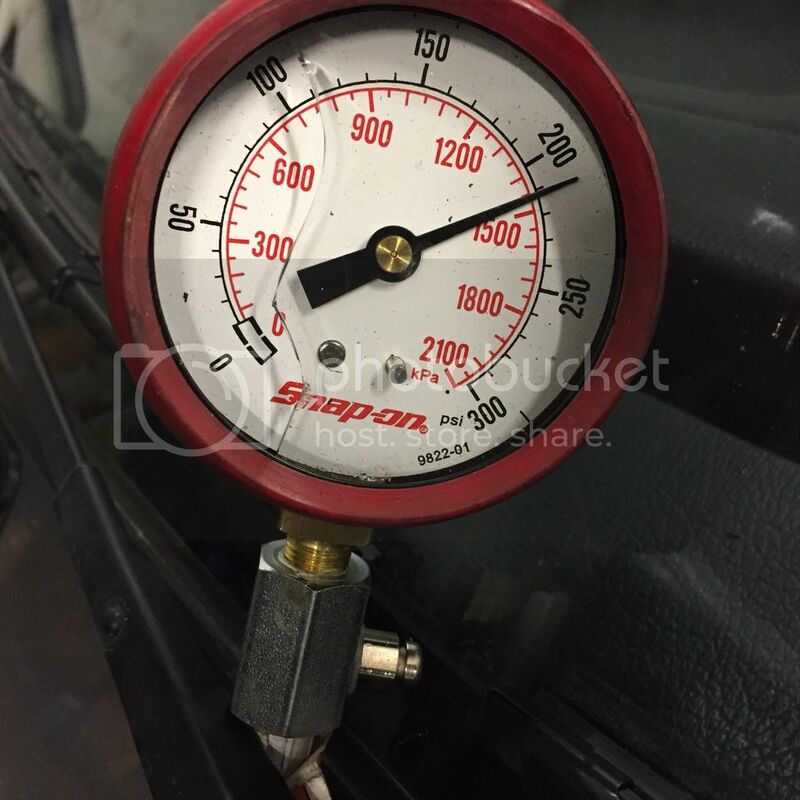 Next up a compression test resulted in a healthy 210 PSI across all four cylinders. Popping the cam cover off revealed a very clean cam box area of the engine which is always a good sign. 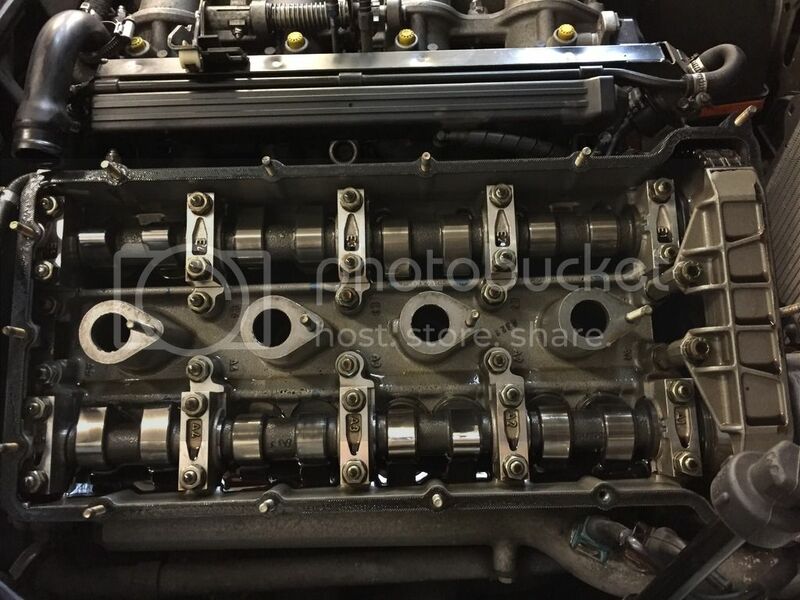 I also checked the cam box and cylinder head parts numbers and the are just standard early 200bhp spec parts. A pair of early schrick cams which tallys up with what the original owner said about the engine built "with cams etc" by BBR! I'm not sure what spec they are yet as the markings do not relate to anything I've seen in the schrick catalogue and i did not have the correct tool with me at the time to measure lift but i hope to get this done before the end of the week. 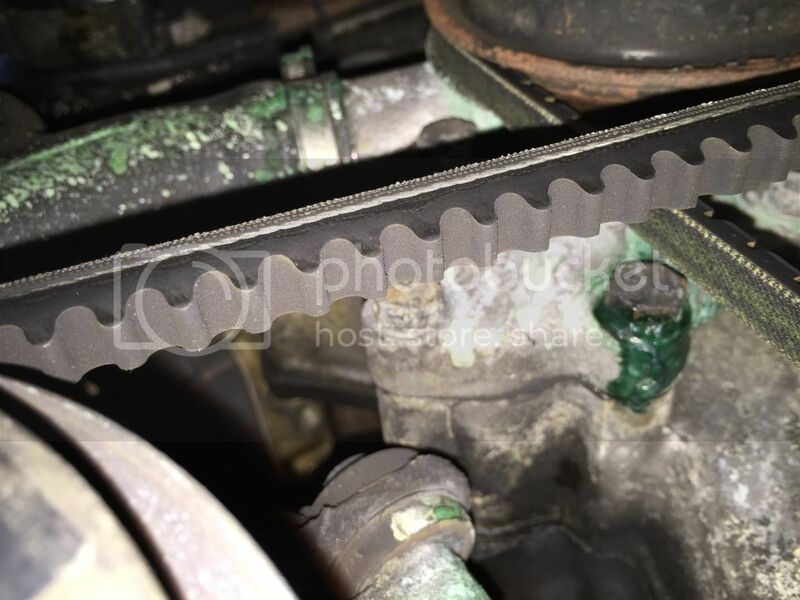 Valve clearances were checked and all were within spec implying a well maintained engine. 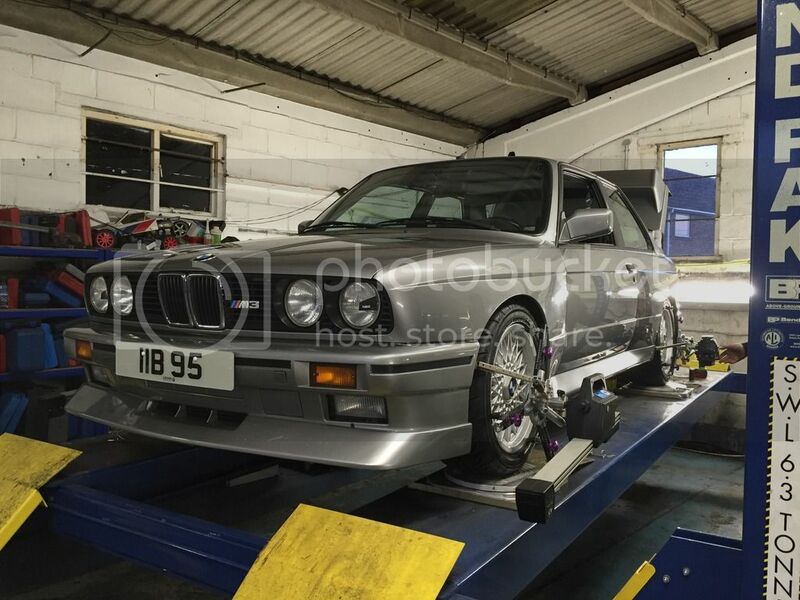 I have a run on the dyno at Surrey rolling road booked for saturday morning so we shall see what we have! 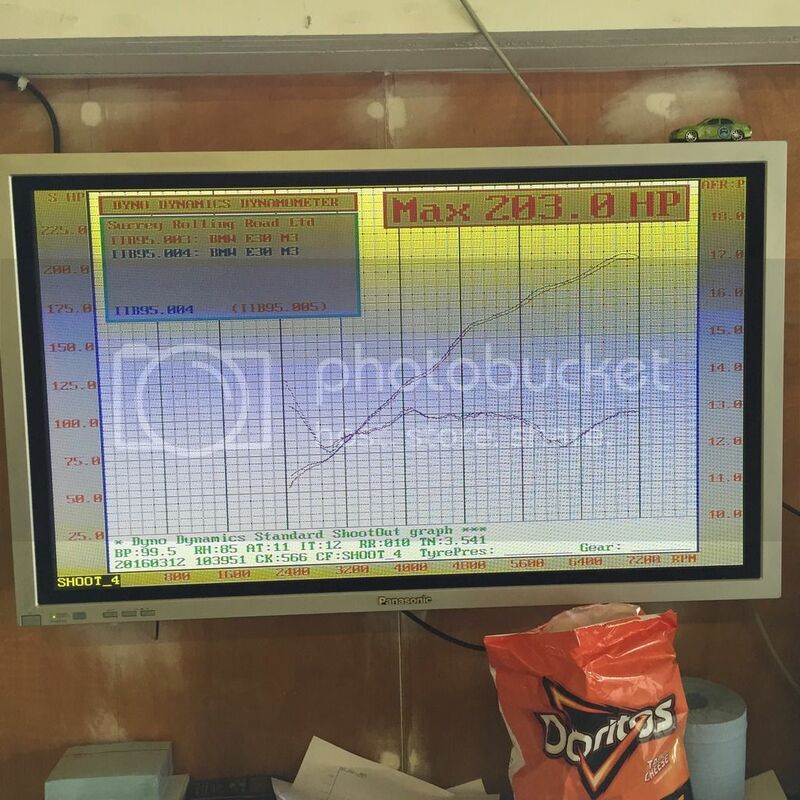 So yesterdays trip down to SRR resulted in a not to shabby 203 bhp, 170 odd lbft and most importantly ok AFR's. I was happy with anything over 200bhp and as i have a track day and ring trip looming i wanted to know the AFR's were good. Ive noticed the oil level has been dropping and engine oil was spotting on the ground plus the coolant level has dropped a touch since I've been using it everyday for the last few weeks so today was time to start to tackle these issues. 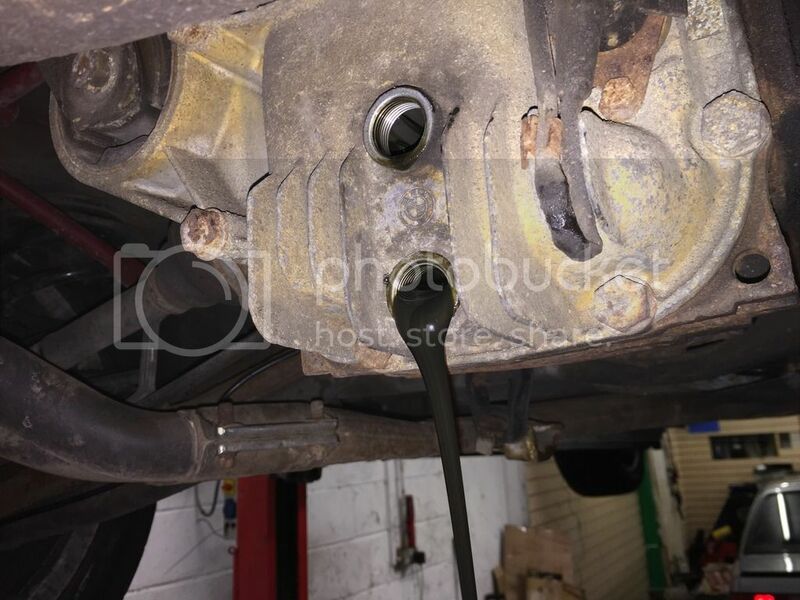 Upper and lower sump gaskets clearly leaking and also the water pump shaft seal leaking. The oily mess removed to be cleaned up. Unfortunately i did not have time to order a baffle this time round but i will be sure to have one fitted before the next track time. 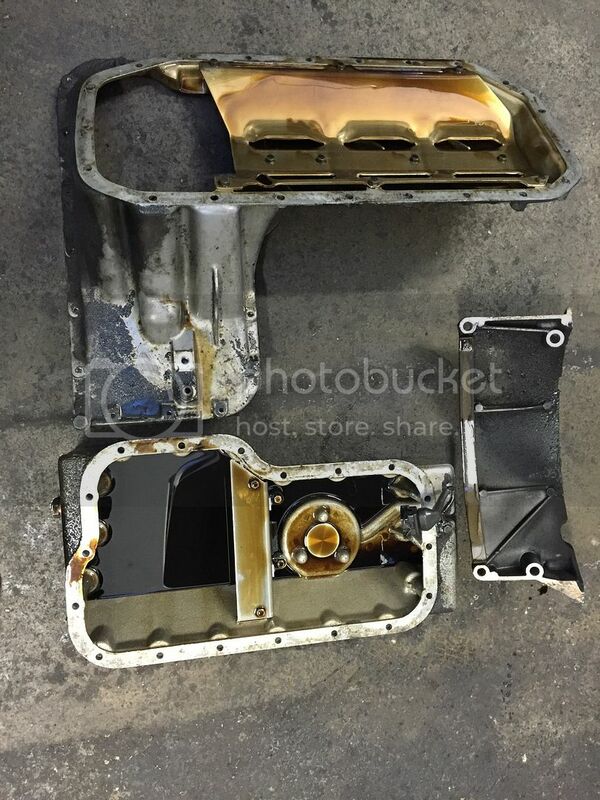 Sump parts cleaned up before being fitted. 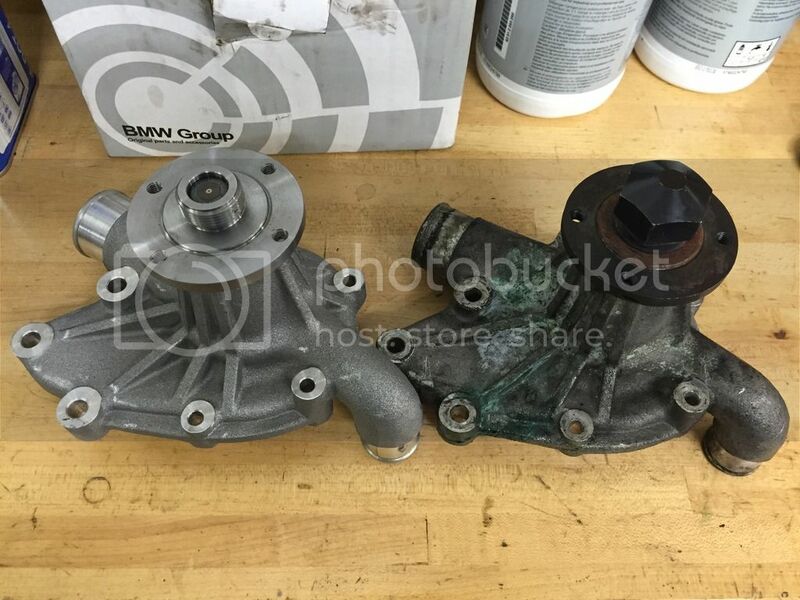 New vs old water pump. 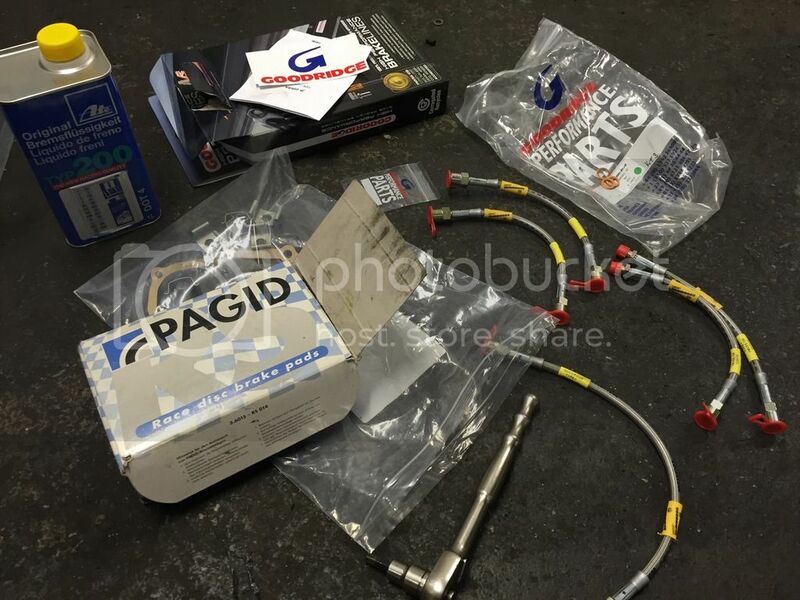 Some brake upgrades were needed as well so some Pagid RS29's, new front discs, goodridge braided hoses and bled through with ATE type 200 fluid saw to that. As you can see the rear axle beam bushes were totally shot and upon removal the date stamp was 6 so one can assume they were the original 1986 ones! Out with the old and in with some new Lemforder ones. 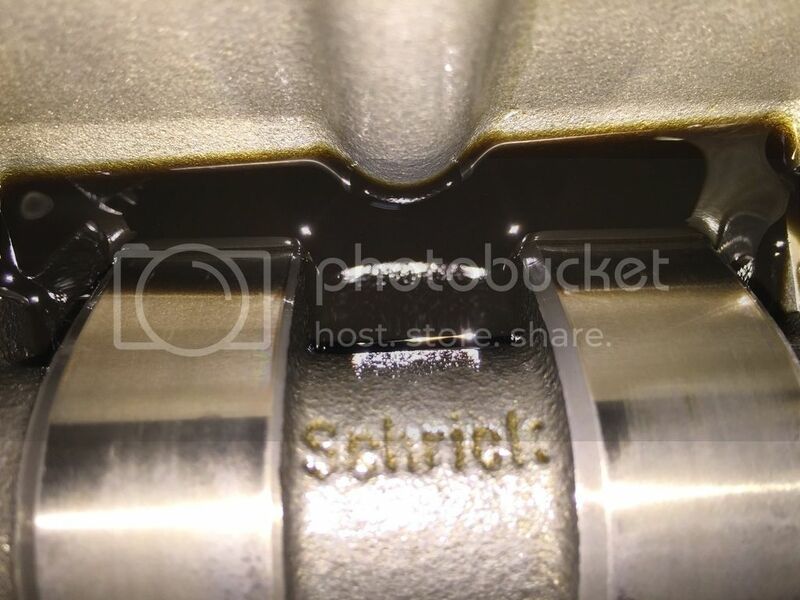 The diff oil was in a sorry state! :o No untoward noises though and seems to lock up ok. Some fresh castor SAF-XJ went in. 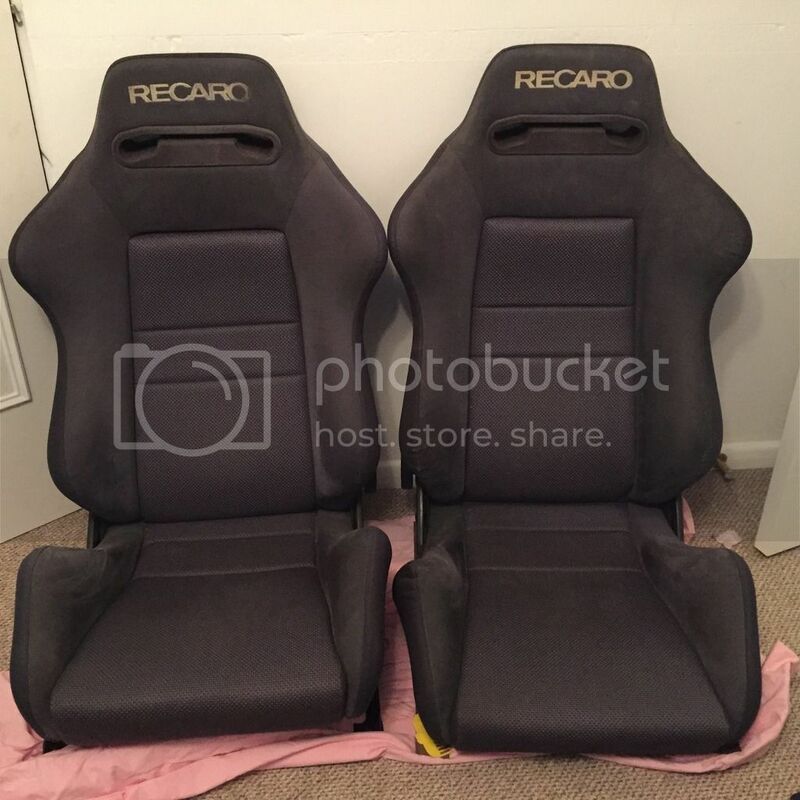 A lucky find on a 5 series forum were these Recaro SRD's for a bargain price. I wanted some more supportive seats as the standard ones are useless on track and even hard road use to be honest and it also means i can keep the original ones nice with minimal use. I will get these trimmed in black leather to match at some point. 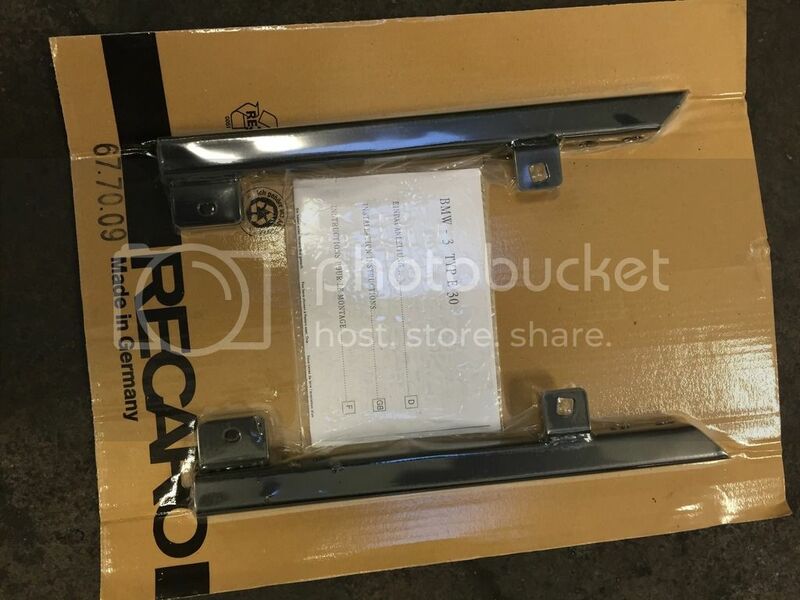 A couple of pairs of theses were ordered from Germany, correct Recaro E30 brackets to mount the SRD's. 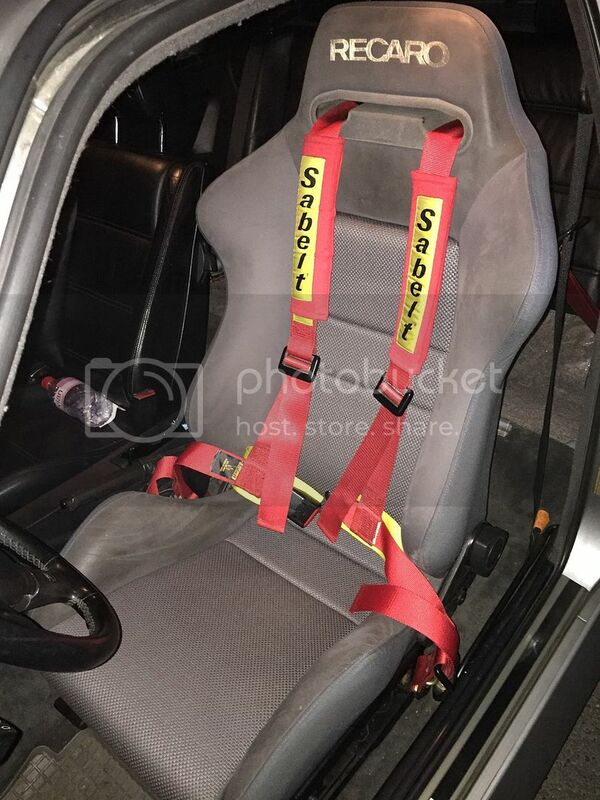 Just enough time the night before the track day to get the drivers one bolted in with a 4 point harness i had. Is it running of the non-cat map due to the way blue and black connectors are connected? That together with the cams would make it feel it more eager. 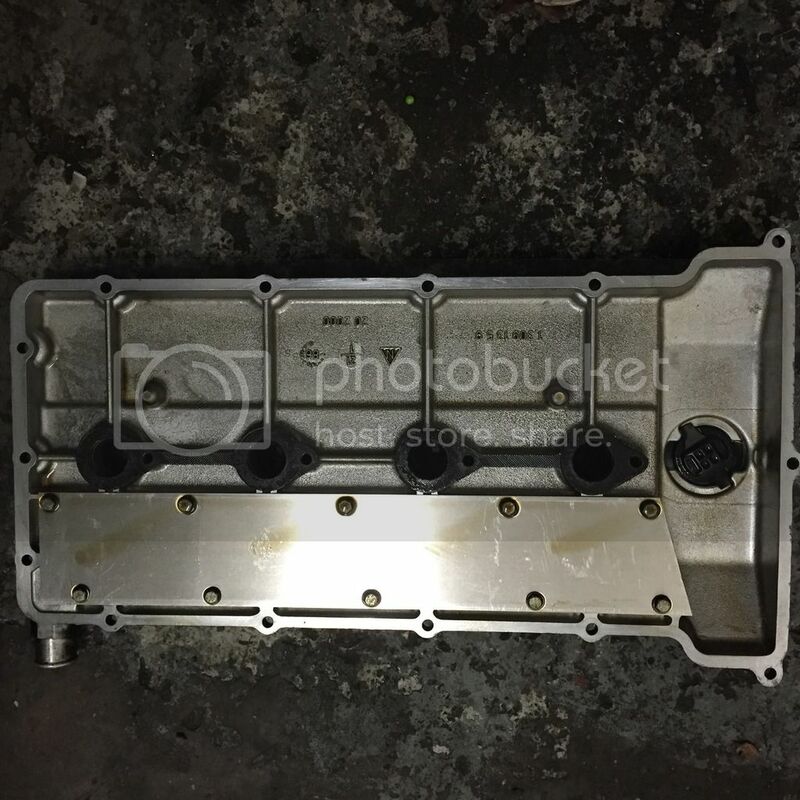 Cylinder heads cant be identified by cast part numbers you'd need to compare the intakes to 195/200 and 215/220/238 PS heads. 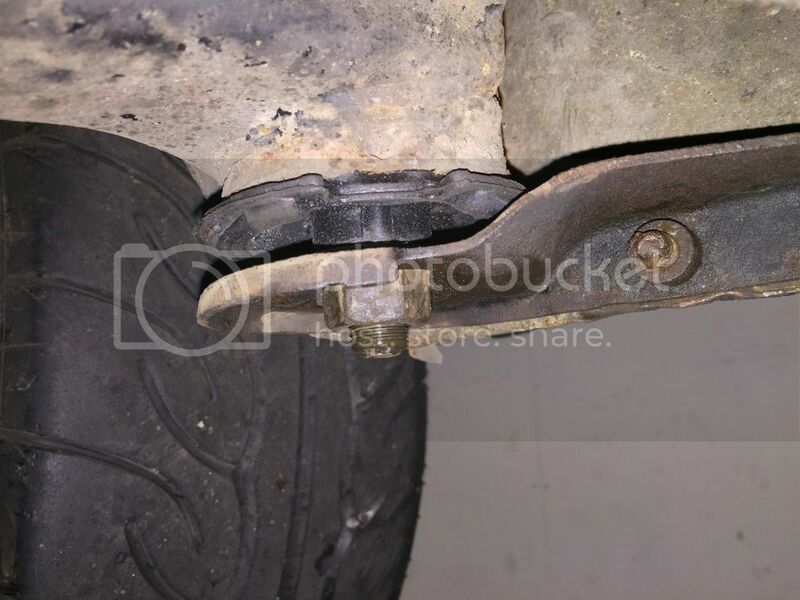 A word of caution re the stock baffle: the rivets that hold the brackets to the baffle break. 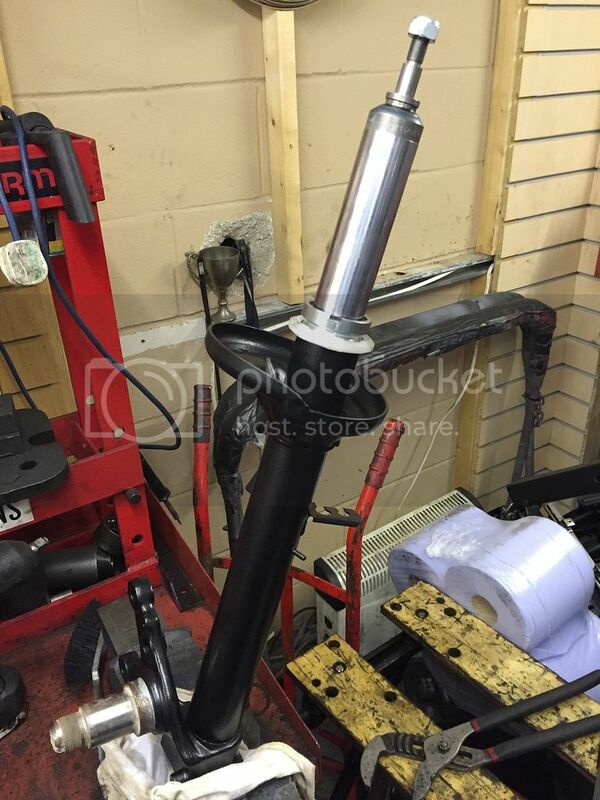 Overfill till the first kink on the dipstick for tracking especially on semi slicks. 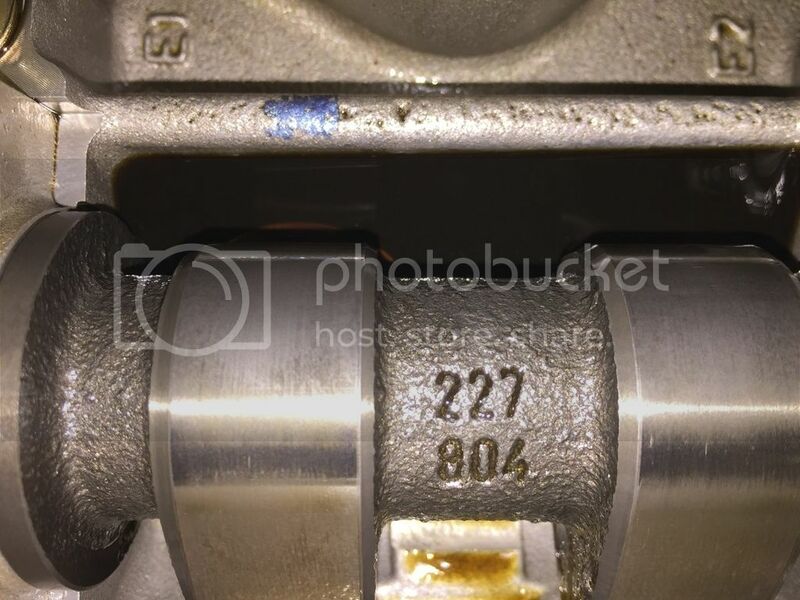 Did you replace the conrod bearings while you had both oil pans off? 227 804 schrick is a 284º cam i believe. edit: Wrong, 227 840 would be 284, dont know what 804 is. 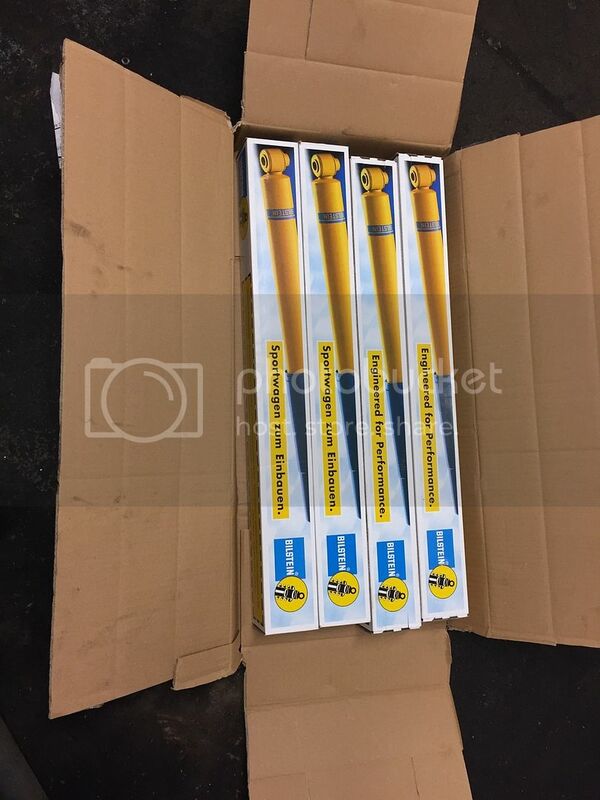 Still have the grp n bilstein inserts? I'd be interested in them. 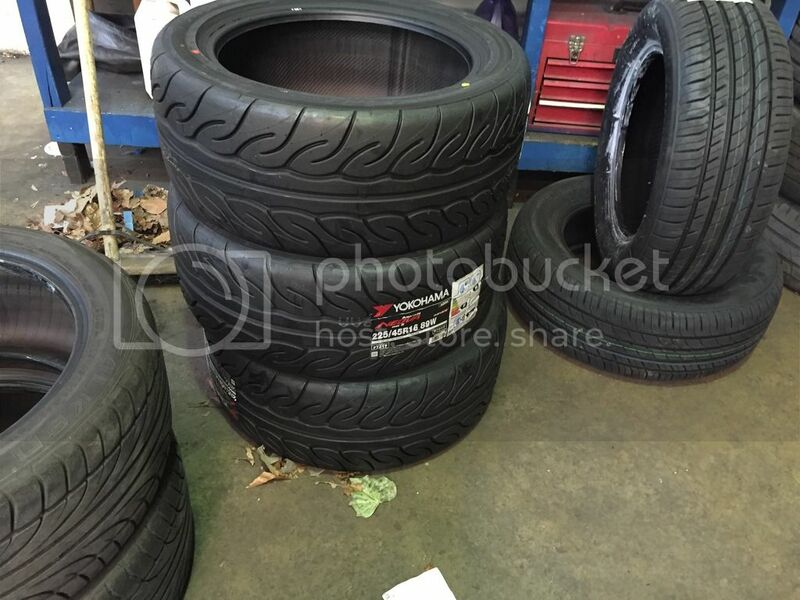 Could you send me pics of the part numbers and rates as a PN please? When are you at the ring? Over easter? I could have someone pick them up right there and then. 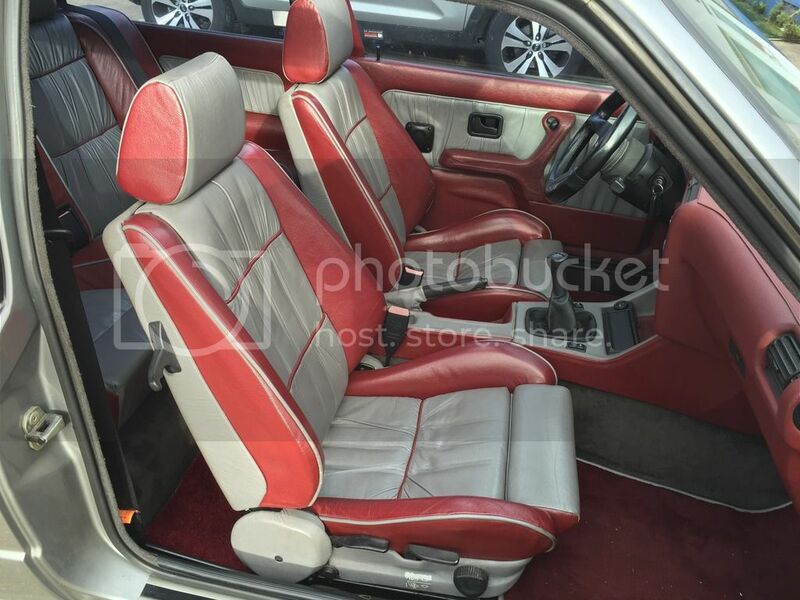 Last but not least: nicely looking car after refitting the new interior! Did you change transmission oil too? 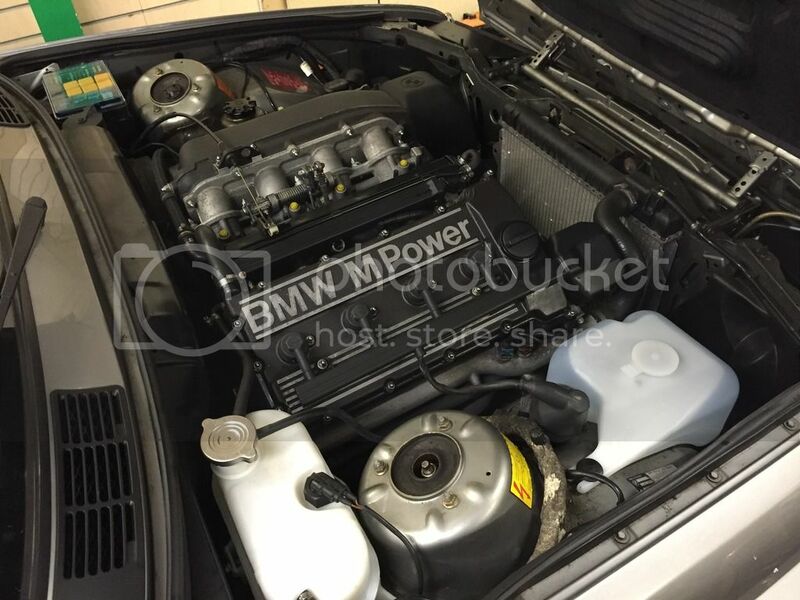 Someone else has confirmed the chip is a standard item and my E30 325i has a VIN label on the DME. Yes the blue and black connectors are connected. When the sump was refitted it was filled with oil to the first kink and checked regularly when on track. 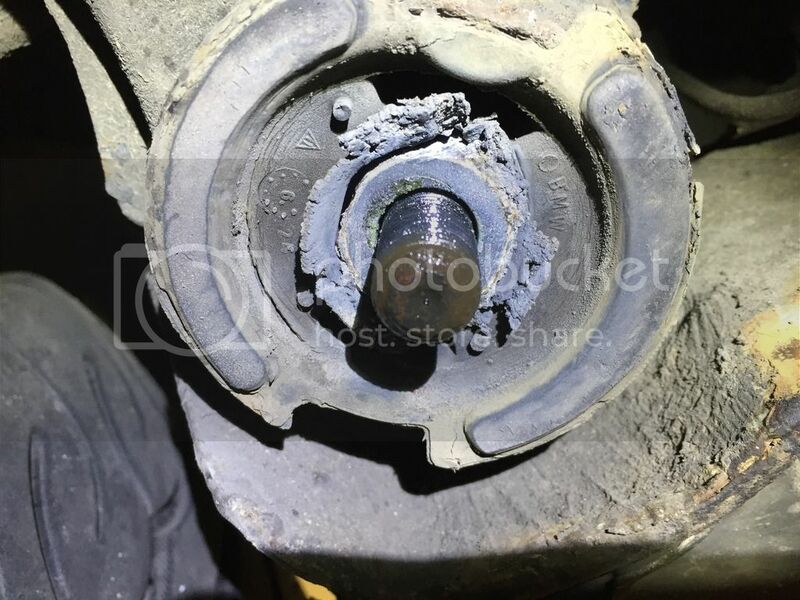 No the conrod bearings were not replaced this time as the car has only covered approx 50k miles since the engine was rebuilt and the car has not seen track use since. The group N Bilsteins have been sold already and i will be at the ring second week of may. Thanks and yes the gearbox oil was changed but it was clean so not really worthy of note.